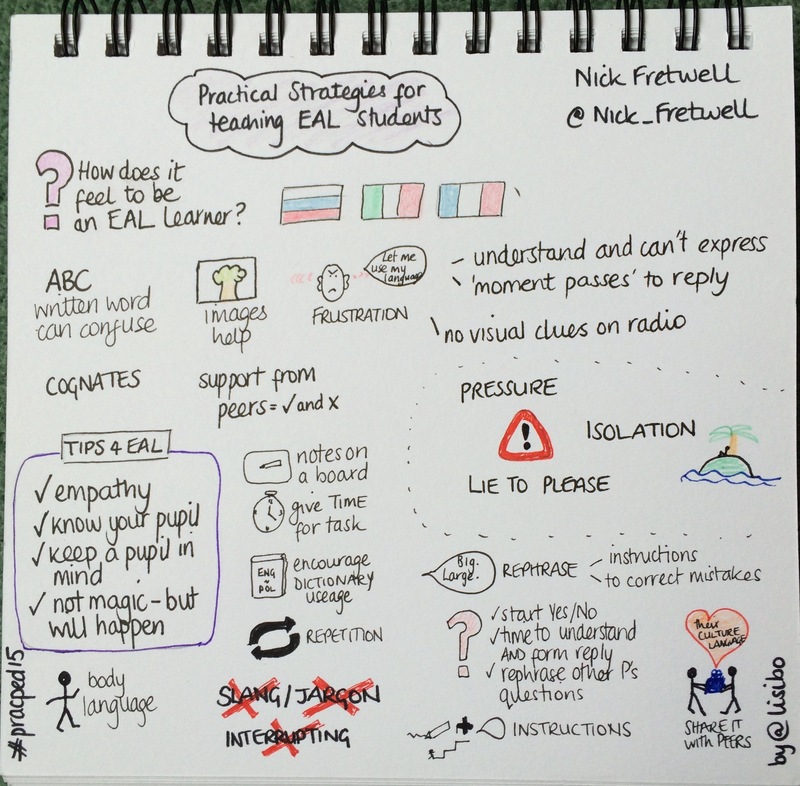 “Educational conferences can be prohibitively expensive for ordinary teachers, and often focus on abstract theory delivered by professional academics with very little hands-on classroom experience. Such events often appear more concerned with making money than with genuinely improving the quality of education being delivered within schools. 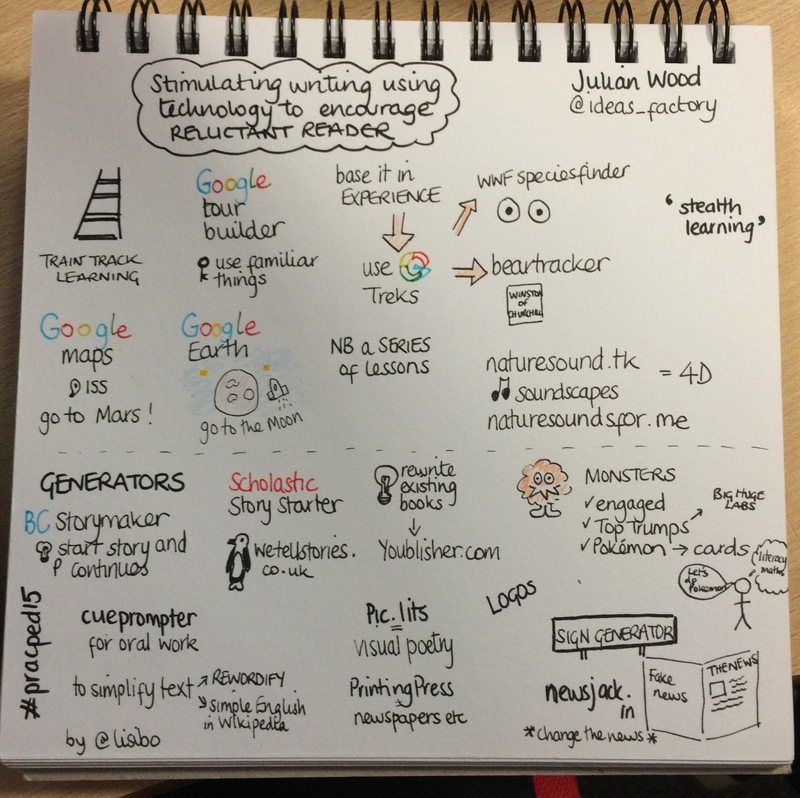 I attended some excellent workshops and chatted to so many people that further inspired me. 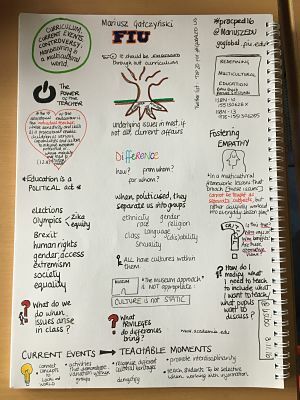 Below are my sketch notes of the conference that document the sessions I attended. I hope that they give you a flavour of the conference. 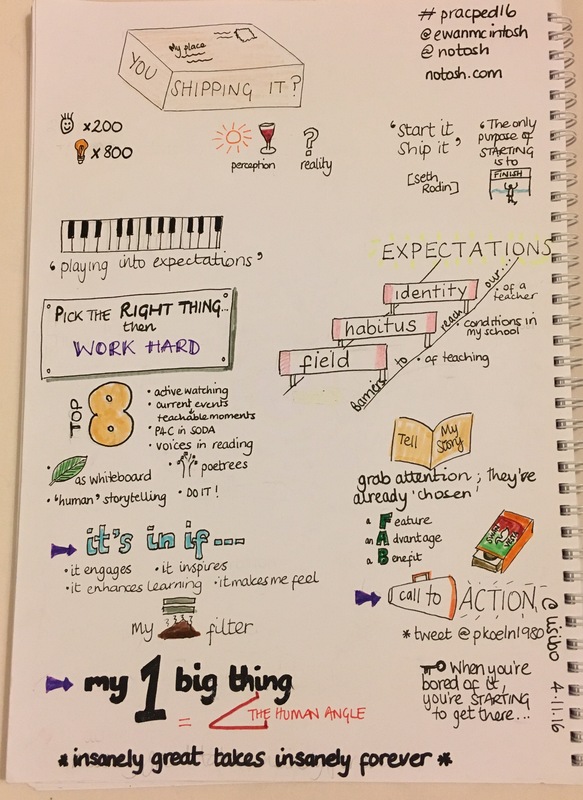 You can find out more by checking out the Twitter hashtag #pracped16 (which was trending at various points in various countries over the two days!) or by looking at the conference website. 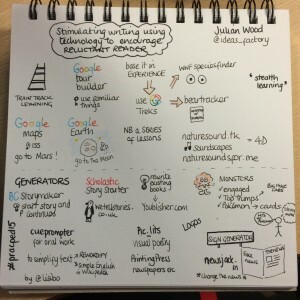 I’m sure that many will share their presentations and that there’ll be lost of blogging so I’ll update the post over the next week or so to share them. 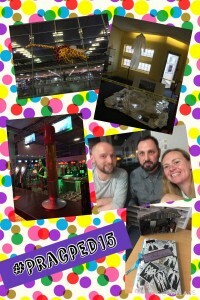 This weekend I’ve been in Nottingham at the NCL (I think that’s what it’s now called!) 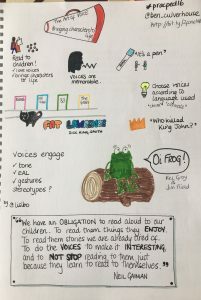 for the National eTwinning Conference. 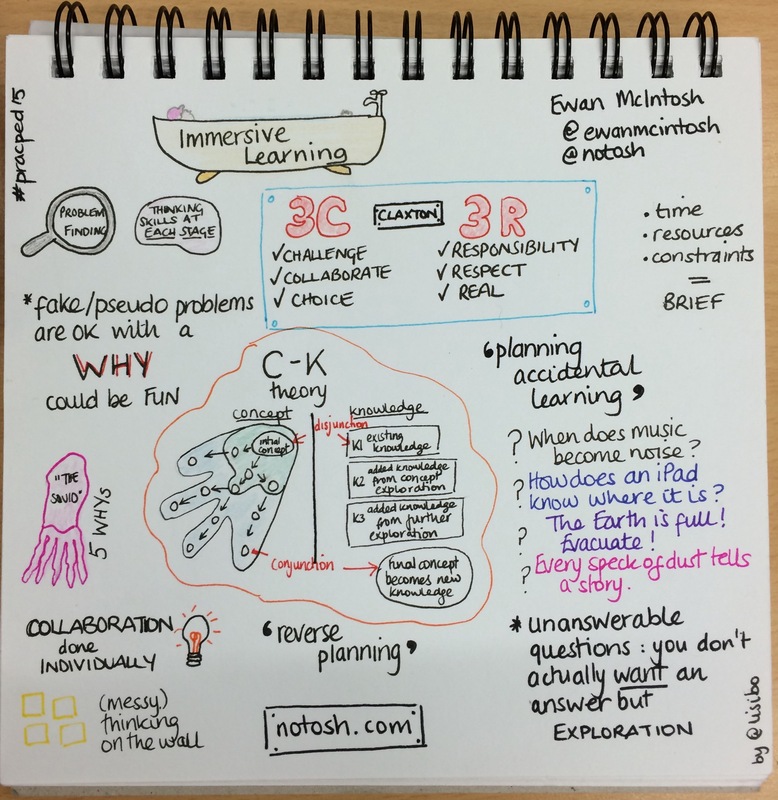 “Interesting” given the events on Friday but also good timing as I can’t think of anywhere I’d rather have been at such a time, reaffirming the joy and value of collaboration. 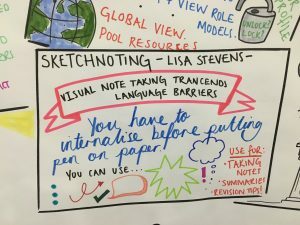 After several requests following fascination with my sketchnoting at last year’s conference, I volunteered to lead a seminar on sketch noting, thus completing my busy week with a third presentation. 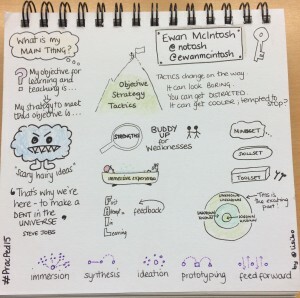 You can see a very similar presentation on my Slideshare channel here. 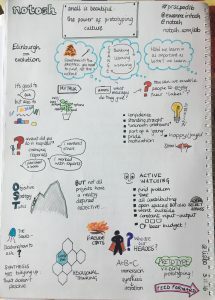 I also sketchnoted as many sessions as I could, trying not to be intimidated by the wonderful @inkythinking InkyEllieC from inkythinking.com who was provided ‘real time graphic animation’ of the event. 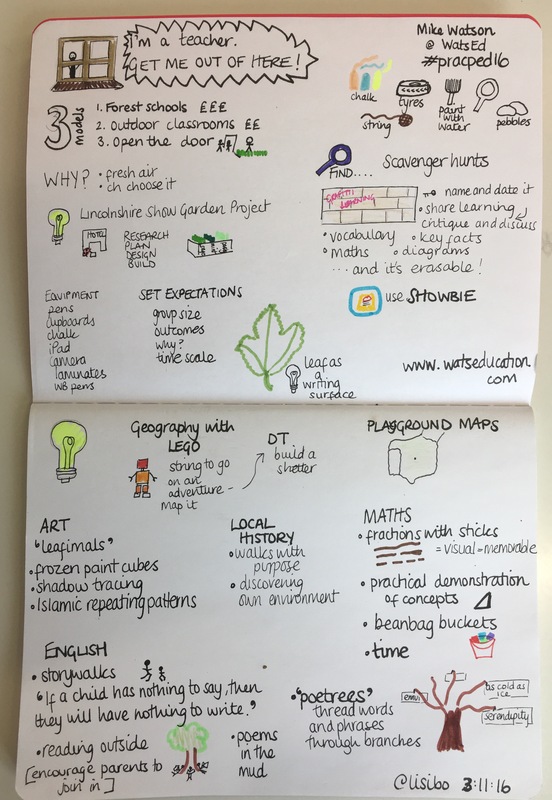 I’ll post my sketchnotes as soon as I’ve had time to tidy them up (not a spare moment all weekend!) as well as my reflections on the event. A hint: I had a great time! I’m a Primary Language Teacher; help me out here! 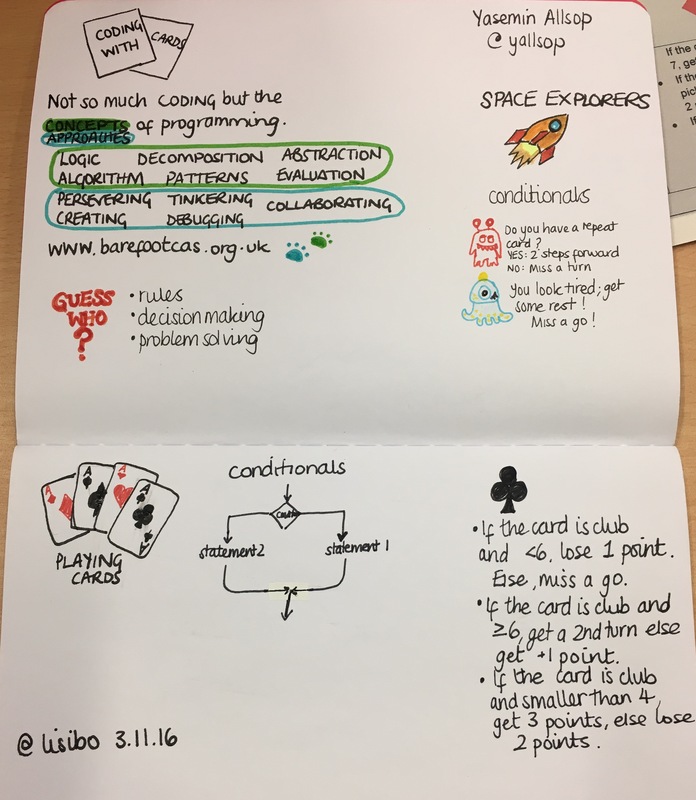 On Wednesday I took part in the Babcock 4S conference at Horsley Park in Surrey. 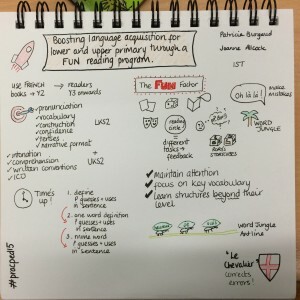 My presentation entitled I’m a Primary Language Teacher; help me out here! was well received and can be found below. language learning is cyclical with topics being revisited but it is a continuum; it shouldn’t start again from scratch at Ks3. teaching primary languages can be lonely but there is support out there. 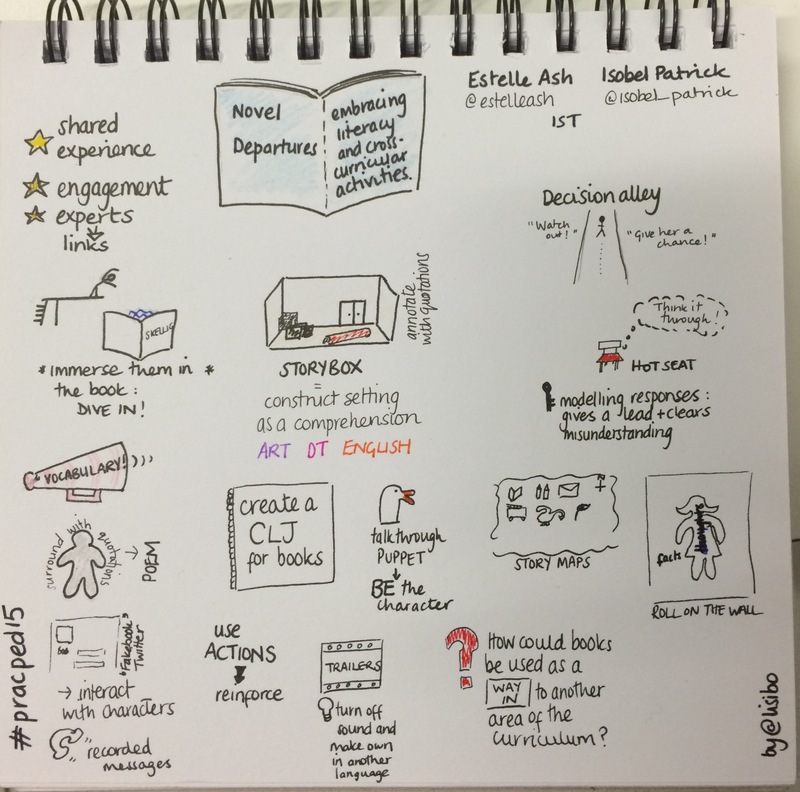 PoS objectives need to be split into manageable chunks or stepping stones. pupils need to become increasingly independent; phonics and language learning skills from comparing and contrasting languages help this. it’s not just about vocabulary; grammar is needed (receptive and later productive) as cement otherwise it’s just a pile of bricks. 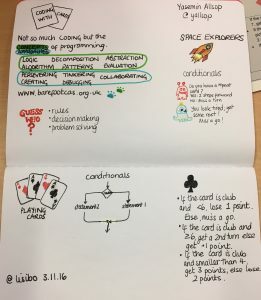 I sketch noted the other sessions and will share them as soon as I have a moment to tidy them up a bit! 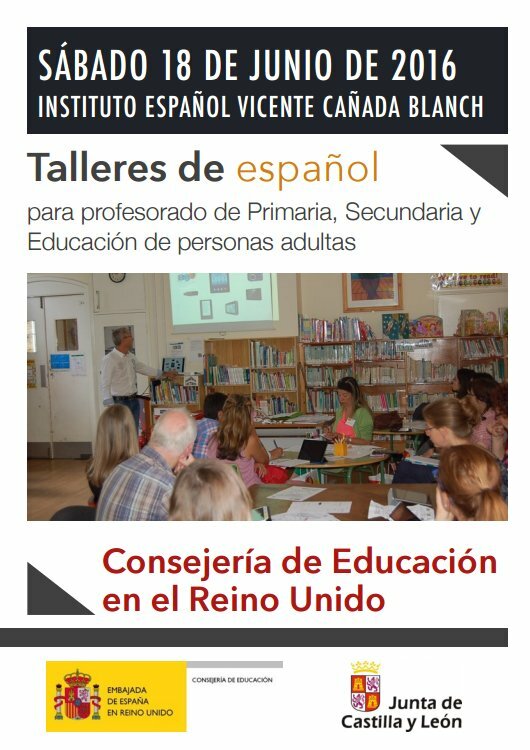 Today I attended the Talleres de español at Instituto Cañada Blanch in Portobello, having been asked to facilitate a couple of Show and Tell sessions as part of the Primary strand in the morning. Having got up very early and had several mishaps and an emergency phone call on the way, I have to admit to being a little frazzled by the time I arrived and then there were technical issues, fortunately resolved fairly promptly and well before my session. 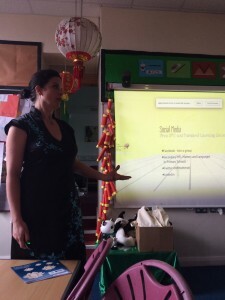 I opened proceedings sharing a ‘super lesson’ on colours that I delivered to Y3. Below is my presentation from today. You can find the poem in Clare Seccombe’s anthology along with many other rhymes songs and poems. 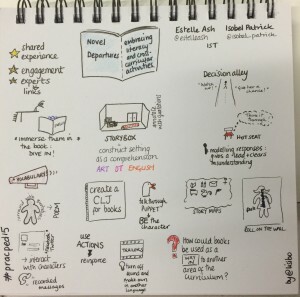 Rachel Hawkes’ website – advice resources and more! 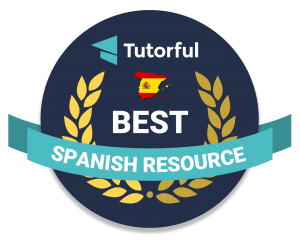 LightbulbLanguages resources – not just Primary Spanish either! A activity using handkerchiefs to review colours with younger children. Using the works of Miró to talk about colour, shape and prepositions. 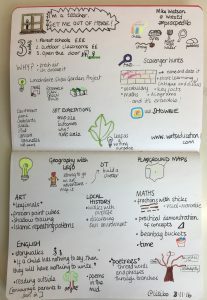 Rachel Hawkes (see above) and Helen Stanistreet (link) have produced some brilliant resources for this. 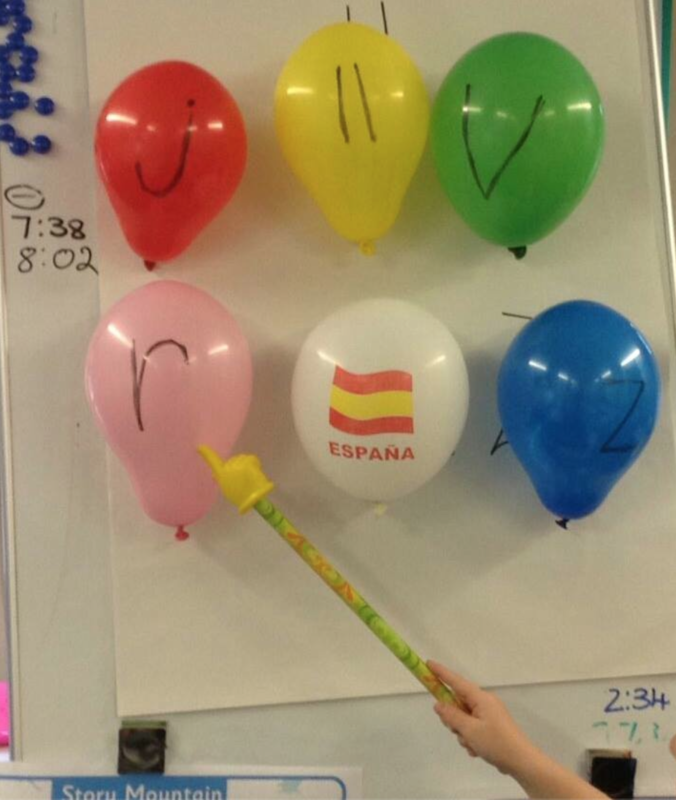 ‘La manzana envenada’ ( a game where there are a number of words/phrases on the board, one of which is declared ‘la manzana envenenada’ whilst one pupil is out the room. The object of the game is not to eat/say the word/phrase that is poisoned as the game will end. Erzsi explains how she plays it here. We also talked about how it’s good to get pupils asking questions as they’re much more skilled at answering them than posing them! I loved ‘dictado chillado’ although it was very noisy! In pairs, learners write a sentence or phrase in Spanish on a post it. It could be anything to do with a topic, or you could say it must include a certain phoneme. Ours were very random! The teacher then muddles up the phrases and hands one to each pair. Everyone then stands against the wall on two sides of the classroom (left/right or back/front) opposite another pair. The idea is to shout your phrase to your partner pair who write it down. I thought my partner pair were yelling ‘Vivo lejos de José’ but they in fact saying Mi conejo se llama José. Either I yelled better than them or it was pair work that won the day as they got ‘Me gusta mucho Gerard Pique’ straight away! 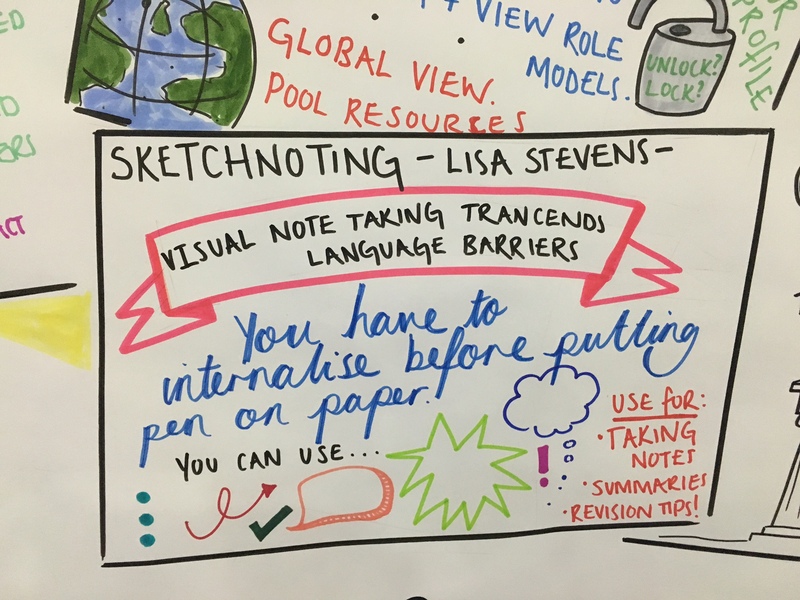 I do feel bad that I’ve failed to sketchnote a session today, especially after my sketch noting was mentioned in by both of the people who introduced me, but I’ll try and make up for it later with one of the whole day perhaps! In the meantime, you can see some of them in my Flickr album. I thoroughly enjoyed the session I attended run by Canela Fina, and I think that all conferences should end with an educational wine tasting! ¡Muchas gracias a la Consejería de Educación y la Junta de Castilla y León para un muy buen día! 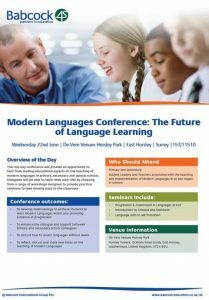 On Wednesday 22nd June I’ll be in Surrey speaking at a Modern Languages conference organised by Babcock4S. 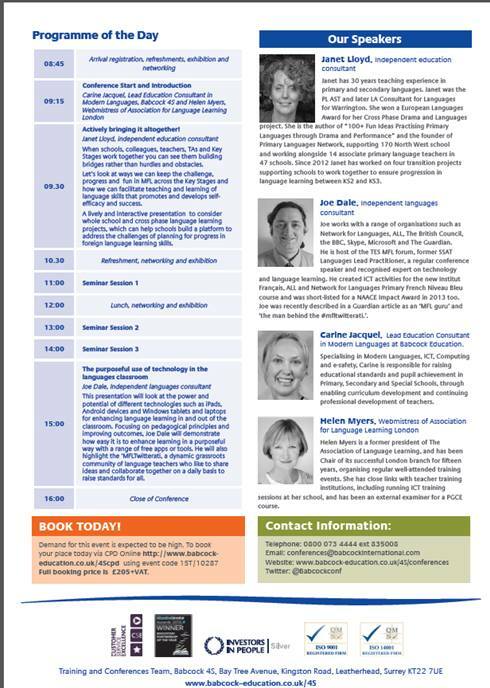 As you can see from the flyer above, the conference is entitled The Future of Language Learning and features keynotes by Janet Lloyd and Joe Dale that ‘book end’ three seminar slots. 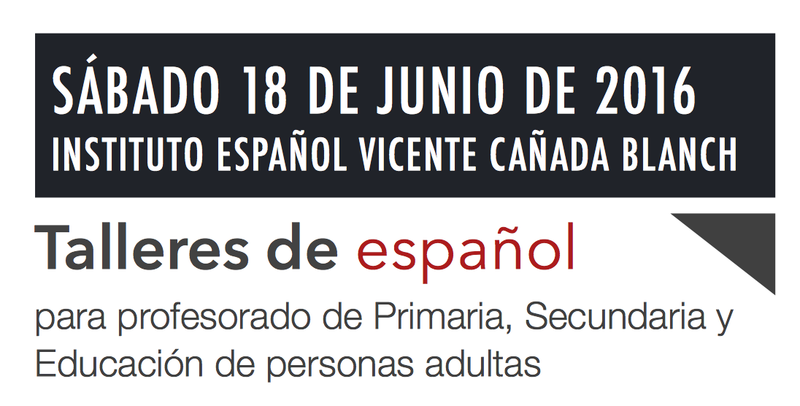 If you check out the conference website you’ll get a basic overview – more details can be obtained from the following PDF Programme of the day. 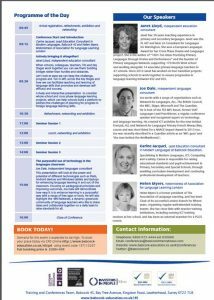 You’ll see that there are sessions addressing assessment, transition, cooperative learning, technology and specific languages led by a wide variety of speakers including Dan Alliot and Suzi Bewell, and convened by Carine Jacquel and Helen Myers. Paraphrasing Shakespeare, “Some are born Primary language teachers, some become Primary language teachers and some have Primary language teaching thrust upon them” How can all three scenarios lead to confident successful teachers and learners, demonstrating significant progress by the end of KS2? 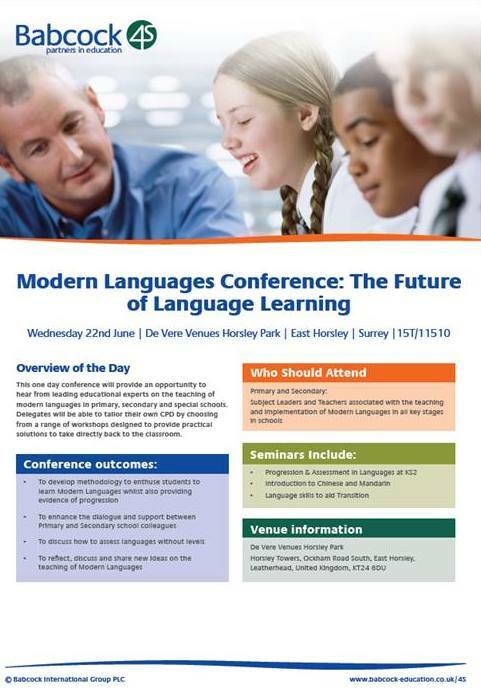 We’ll explore how to plan for progression (in the long and short term), share sources of support and inspiration and discuss how to best meet the challenges of the Languages Programmes of Study. 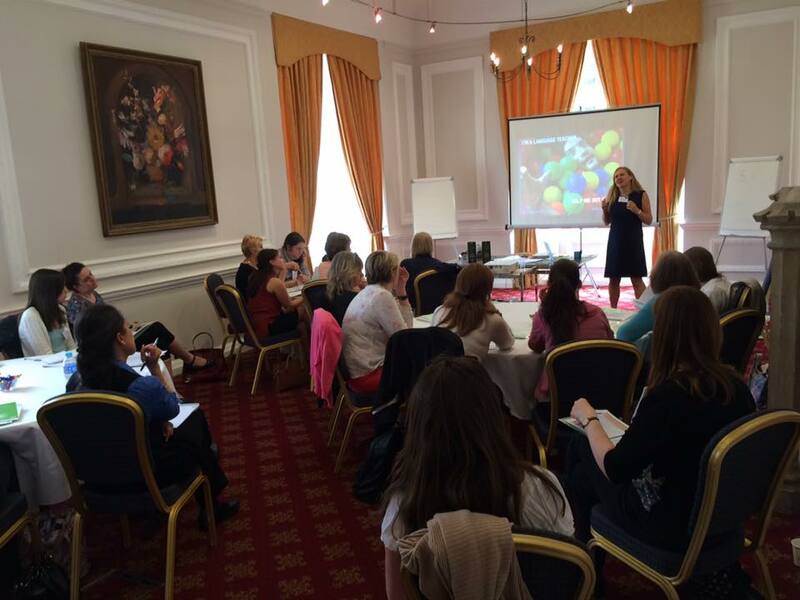 It’s not too late to sign up (which you can do here) for a day of inspiration and networking. 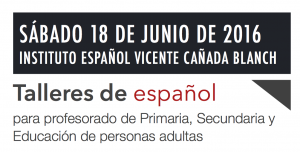 Following on from Language World and the success of the Show and Tell, Jesús from the Consejería de Educación asked if I could facilitate one at the annual Talleres de Español. Unfortunately my partner in crime Clare is unavailable so I’m going it alone. However, I hope that there will be participants who want to share their ideas, celebrate their successes and suggest suitable resources during the session so I don’t end up talking for the entire 50 minutes. 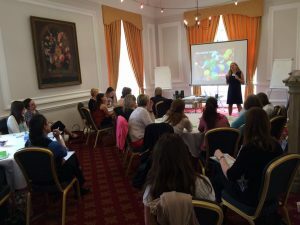 The programme offers sessions in the morning tailored specifically to Primary and Secondary colleagues followed by general sessions and cultural workshops after lunch (which is always very special!) I’m speaking at both of the morning sessions which means I can’t attend the parallel Primary sessions (hoping someone will take notes for me – any volunteers?) but am spoilt for choice in the afternoon. 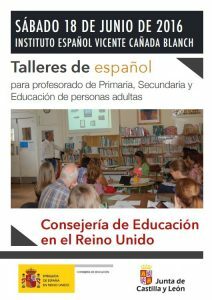 I spoke at the Talleres in 2011 – you can read all about it here and it will be wonderful to return to Instituto Español Vicente Cañada Blanch. And I always enjoy meeting others and discovering new ideas! Why not join me? Above is the flyer and below are the details of each session and the presenter bios. 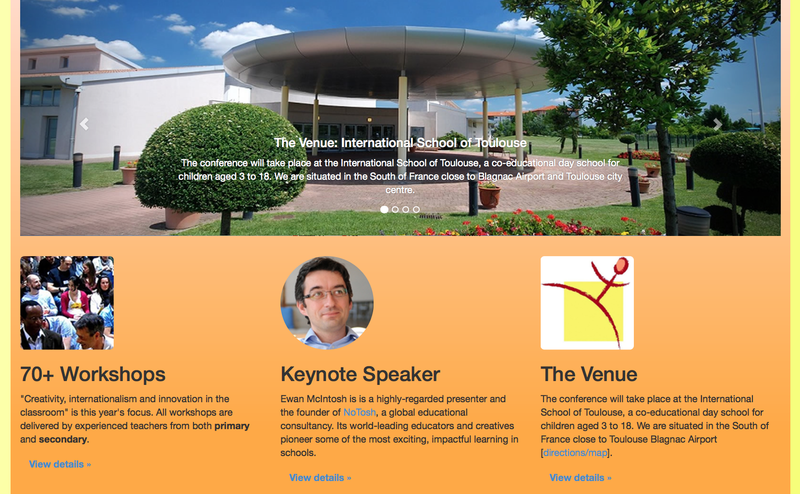 I had the joy and pleasure of going to France last week for the Practical Pedagogies conference at International School of Toulouse. It’s not every day you get to go on a course that involves a ‘plane journey, and I was wondering about the wisdom of my exploits as I sprinted from one side of Brussels Airport to the other with 20 minutes to make my connecting flight thanks to high winds delaying my incoming flight… I made it, and it was well worth the travel and the late night. What a conference! Why? Well, there were many reasons! The organisation. Never have I been to such a well organised conference. Things ran to schedule, the gaps between sessions meant that you always had time for coffee even if you stayed behind to ask a question at the end of the previous one, and I never felt the vertigo I often feel as I rush from one place to another without breathing. The company. What a great bunch of people! I laughed until I cried at points and enjoyed the friendship offered by those I already knew, those who I’d only previously known online, and those who were completely new acquaintances. Fun and games involving hats, Lycra, yards of beer and bowling alleys spring to mind. And 5. The variety of sessions was amazing! Covering any subject you could name plus cross curricular ones as well as technology and even ukelele playing. It was very hard to select just 7 (I was told I had to choose my own session) but I did. 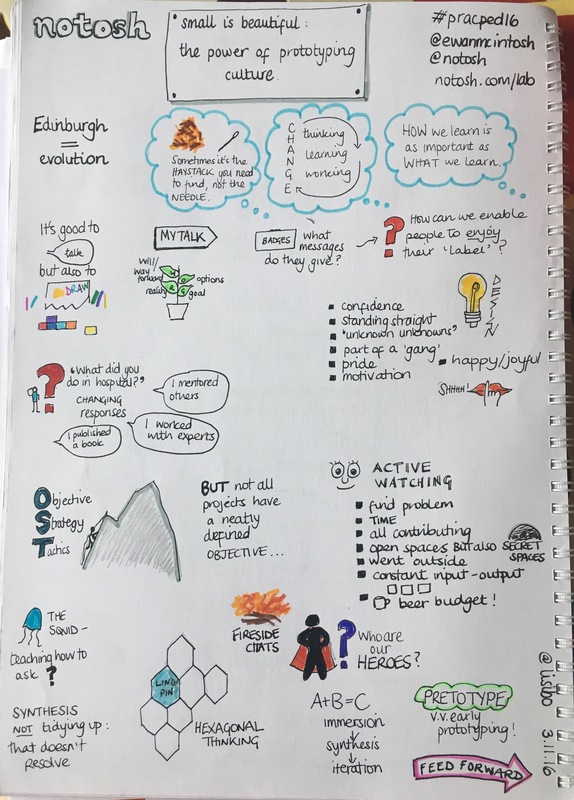 I tried to sketch note all the sessions I attended, only failing twice as I couldn’t draw during the Drama workshop and it was hard during the AIM one as I needed to use my hands to gesture (and I’m also rubbish at drawing hands!) Anyway, I’ve uploaded my notes below. PS I think that every good school needs a ‘crime scene’ in the foyer complete with police tape, forensics suit and evidence. Talk about capturing the imagination! I always get excited when people invite me to speak at conferences but I was very excited when Russel Tarr (created Classtools.net and was famously attacked by Gove for using Mr Men to help teach History resulting in a mass Mr Men Twitter avatar protest in solidarity!) asked me if I’d like to speak at a conference he was planning in Toulouse. A trip to France? Don’t mind if I do! And when he told me who else was speaking, I was even more excited and also perhaps a little daunted when I saw who else was speaking! A high-impact training conference for classroom teachers by classroom teachers. Two days of inspiring keynotes, 70+ workshops and networking activities: only 150 Euros! I’m very much looking forward to the conference as there are so many different sessions under the umbrella theme of “Creativity, internationalism and innovation in the classroom” that it was very hard to choose which I’d like to attend. 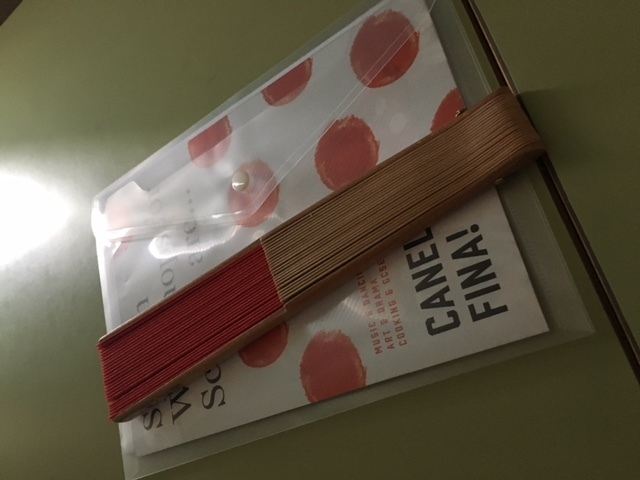 The programme is packed with goodies as you can see! 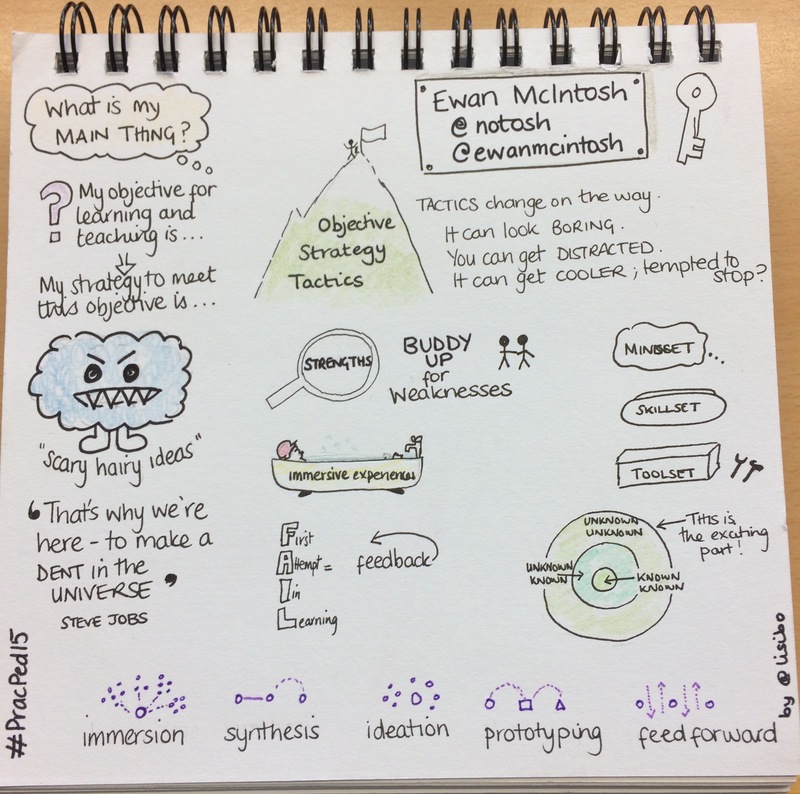 And Ewan McIntosh @ewanmcintosh @notosh who is keynoting and also delivering workshops always inspires and challenges! 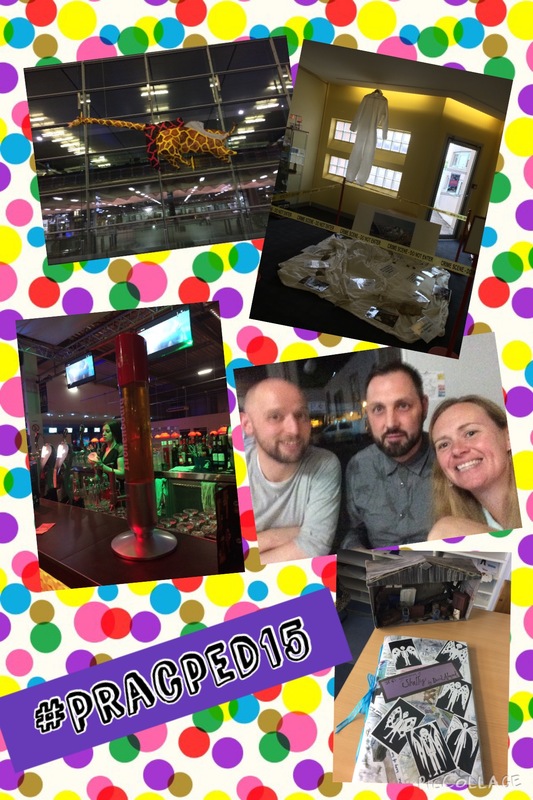 History including a session about collaboration between History and Geography (and beyond!) 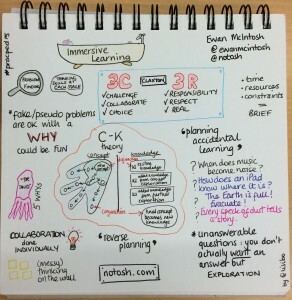 led by Russel Tarr, author of ActiveHistory, and Matthew Podbury, author of GeographyPods. Languages that features people I know like Isabelle Jones (@icpjones) and those who I have yet to meet like Dico Krommenhoek (@dico_kr). Oh, and me! 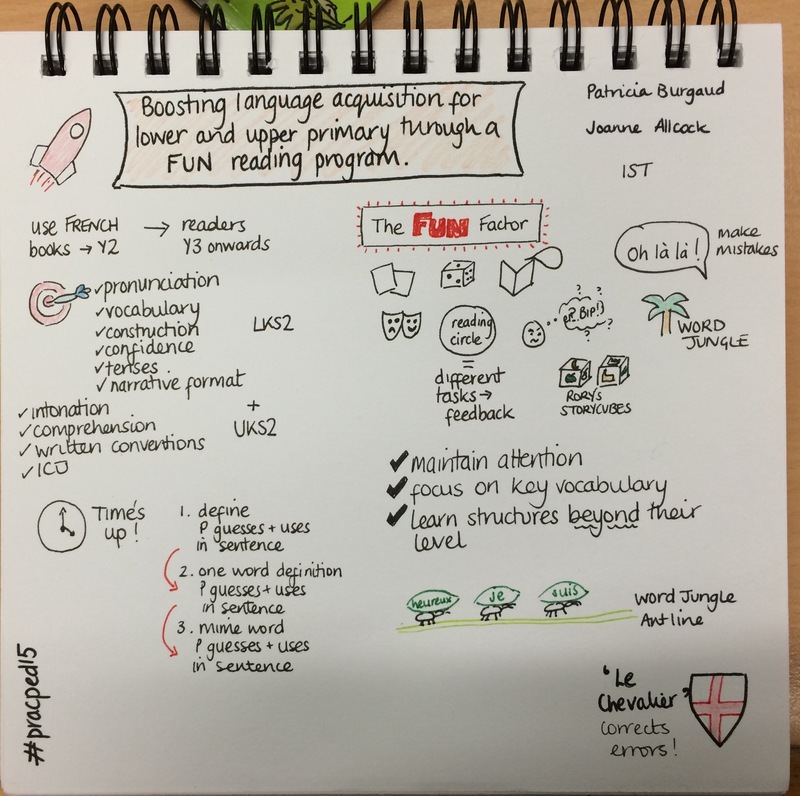 I’m very much looking forward to finding out more about AIM and how IST use a FUN reading programme to boost comprehension and expression with their upper primary language learners. There’s still time to register if you’d like to attend. It costs 150 euros (very reasonable) and if you can get a cheap flight it’s not much more expensive than two days of INSET! It’d be great to see some of you there and if not, converse via Twitter. 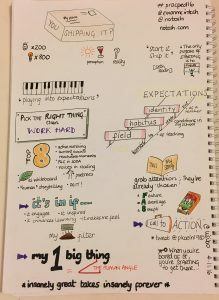 And of course I’ll share my thoughts (and sketch notes!) on my return! 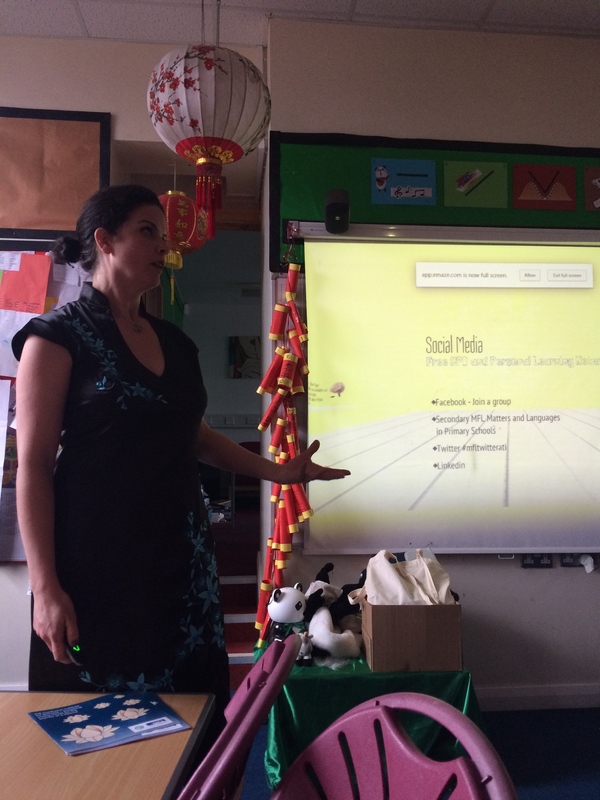 On May 6th I made the trip across Birmingham in rush hour traffic to attend TeachMeetWM organised by the irrepressible and absolutely bonkers Simone Haughey at her school Robin Hood Primary. I sadly missed the choir singing and the start of proceedings thanks to a staff meeting and the traffic, but I arrived in the end to be greeted by delicious Chinese food saved for me by Sim and lots of friendly faces including John Rolfe and AnaPaula Booth from the British Council, and the staff of Robin Hood who are obviously well used to Simone as they didn’t bat an eyelid when I asked if they had a couple of hula hoops I could borrow! 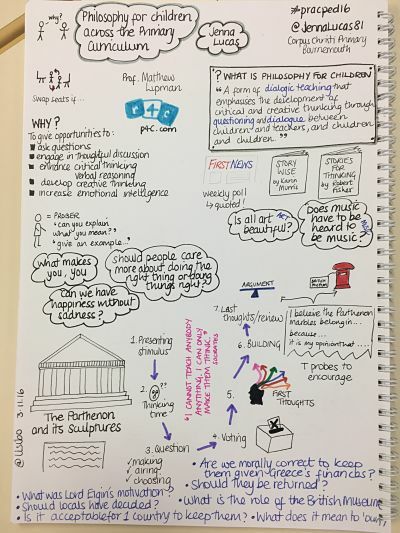 There were many great presentations on the night including a couple via video, and you can see what you missed by looking at the Storify of the tweets at the end of the post. However, my presentation is below as promised for those who were there. How I managed to explain it all in 7 minutes I do not know but I avoided being attacked with a cuddly toy! Do leave a comment if you have questions! 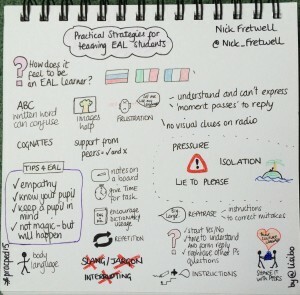 I was rather gobsmacked when Zena asked me to do the closing keynote at #ililc5. An offer I couldn’t refuse but daunting nonetheless. Especially as there was no ‘theme’ this year so I could talk about ‘anything’ according to my instructions! As Christmas came and passed and I still hadn’t really been inspired, I grew more concerned. It wasn’t until mid January that a seed of an idea formed in my head. I’d been prepared to talk about Cupcakes and Smiles at TeachMeet BETT, a short presentation on education being about ‘feeding’ minds but also celebrating and rewarding learning, and that we did it for those ‘smiles’ that happen when the lightbulb goes on, when the unexpected happens, when you’re speechless at something a child has said and so on. 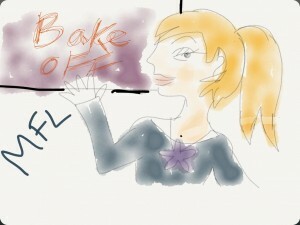 There was no time for my presentation then – although I still shared my cakes. I was a bit annoyed as lugging a few dozen cupcakes from Birmingham and around London on the train and Tube is no fun and nor is being told off for daring to ice them in the presence of Sir Ken Robinson but that’s the way it works. Still, I liked the idea of cupcakes and when there were queries as to why I made cupcakes for TeachMeetBETT but not ILILC, the idea began to germinate. Over the next few weeks I still wasn’t entirely sure what I’d say but a thought here and there occurred to me. Stupidly I didn’t write them down and I’m sure some ‘got away’. However, with help from my husband John (who must be fed up of my food/language analogies!) who told me to get a grip (and a notepad), Cooking on gas (other fuels are available) grew. 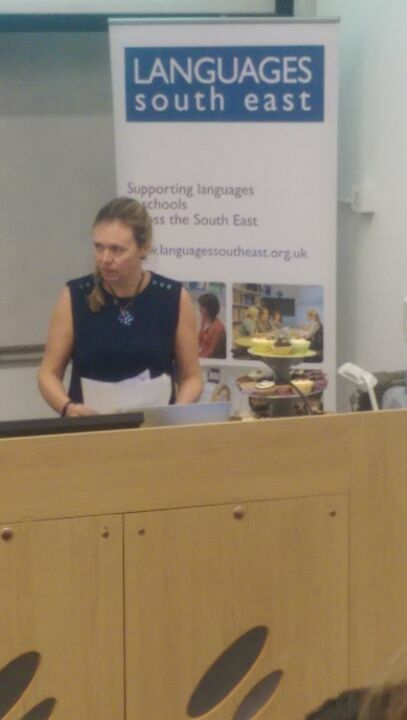 On the day, armed with new shoes and an assortment of cupcakes, I shared my thoughts about language teaching and learning with the remnant that had managed to survive to the (not so bitter) end. And it was recorded! (I’d forgotten about that part until I was standing there.) You can watch it here. As my presentation was in Keynote and delivered from my own MBP, the slides don’t show up in the recording but are all synced and appear alongside (thank you to the lovely Matt for doing that!) I’ve added the videos that you can’t see but can hear at the bottom of this post; I know that the Intermarché one about Les fruits et légumes moches has already proved helpful to more than one person! 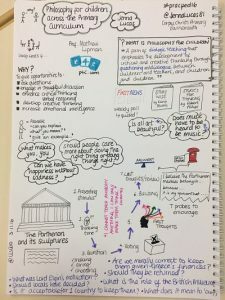 It’s very different when you’re sharing your personal thoughts, reflections and passions; it made me feel very vulnerable so I’m really glad that people picked up on and identified with the key messages I wanted to share. PS At 23 minutes, I start talking about my language hero, and whilst I think I communicated that she was special, I didn’t share all that I might have done as time was pressing and I was getting choked up. So in my next post, I’ll tell you all about Luz Sánchez-Richardson, my language hero!